A year ago, I accepted a position with a small IT startup company based in Chicago. The position was remote, and I was the only person west of Chicago. I have a very social personality, so I knew I would feel isolated working for a startup outside the telecom industry I’d been in for 20 years. The new position was going to be challenging and outside my comfort-zone, but very exciting. I would be working within the Microsoft ecosystem of MSPs/CSPs selling a public cloud automation product that had only been on the market for a year. My role would be recruiting, onboarding and owning the entire partner lifecycle. I knew that to be successful I would need contacts outside of my existing network that I could leverage to help me find and recruit business partners up and down the West Coast. I knew I would need to join industry groups to build a robust data-centric network. I was already curious about Alliance of Channel Women (ACW) and believed it would be a wonderful way to meet other professional women, help me expand my network, collaborate, learn, and grow professionally and personally. When I signed up as a member of ACW, the first question I asked during my on-boarding call was, “when is the first meeting?” The response was, “We don’t have a Northern California Chapter, would you like to start one?” I’d just started a new job and I really wanted to give it my undivided attention and focus. Instead of saying no, I asked to share the responsibilities with another NorCal member. Soon, Su Beler, Partner Support Manager at Telecom Brokers, raised her hand to be the co-moderator. She and I met for lunch, charting out our strategy and vision of building a new chapter of ACW in Northern California. We had our first official ACW NorCal Local Chapter meeting at a great spot in San Jose with the help of Erika Schmidt, Channel Manager at RingCentral. It was a small group, but the time was invaluable. We shared some ideas, commiserated and had fun. As we continued to grow our chapter, we reached out to our member community for help in finding a venue for our next meeting on March 4, 2019. The Cyxtera channel team — Jean O’Neill, Vice President of Channel, Natalie Prcevski, Pre-Sales Leader and Tamara Prazak, Director of Channel Strategy and Marketing — all stepped up to offer a fabulous venue for our meeting at the Cyxtera Data Center. Jasmina Muller, Regional Vice President of Channel at 8×8, provided us with great food and beverages for our meeting. Our evening was such a great success thanks to everyone’s efforts. Event attendance had doubled from our last meeting! We enjoyed an inspiring and interactive presentation about being powerful from Nancy Ridge, Executive Vice President at Telecom Brokers and one of ACW’s co-founders. Some of the topics covered were around cultivating inner power. “What conversations am I having with myself and with others?” “What conversations do I need to drop?” It was a very inactive evening with a lot of great discussions, as well as getting to know new and fellow members of our growing ACW NorCal Local Chapter. I’ve gained so much from membership in our ACW NorCal Local Chapter. Now, I’m tapping into ACW’s mentorship program to match me up with a mentor. I was recently laid off from the amazing startup I joined last year, so I’m hoping to leverage my ACW membership in an area I did not think I would need – finding a new job in the channel. 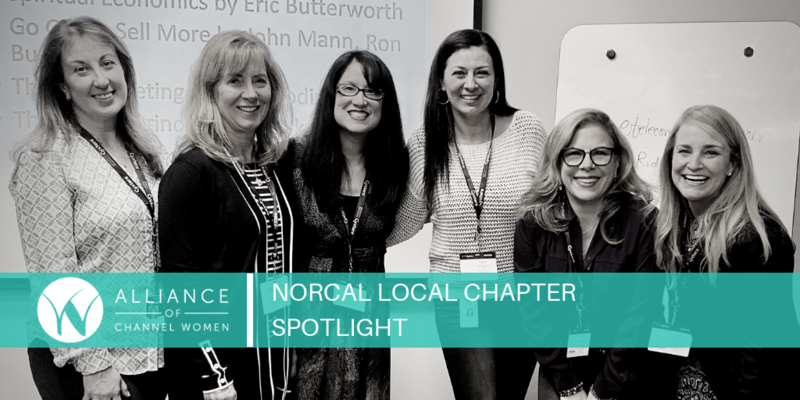 Our plans for the future of the ACW NorCal Local Chapter are to provide our female peers in technology a valuable experience through membership where we can nurture, support and empower each other professionally and personally as well as grow our business. My wish as we build and shape the ACW NorCal Local Chapter is that our members will enjoy the same great experience I have and choose to get involved and join us at our meetings. The time I’ve spent with ACW has been nothing short of incredible. I’m so excited to be part of growing our chapter and giving back to the future of ACW in Northern California. Dana Laytham is co-moderator of the ACW NorCal Chapter along with Su Beler of Telecom Brokers. Laytham is an experienced channel account manager with a demonstrated history of working in the software industry, including enterprise private and public cloud solutions, sales, go-to-market strategy, channel recruitment and development, professional services, and data center products. Connect with her on LinkedIn.